Right to Movement is a sports platform that highlights the basic human right of freedom of movement and empowers women to be the future leaders and runners of Palestine. Right to Movement is a running based social group that has nine branches all over Palestine and few international branches. 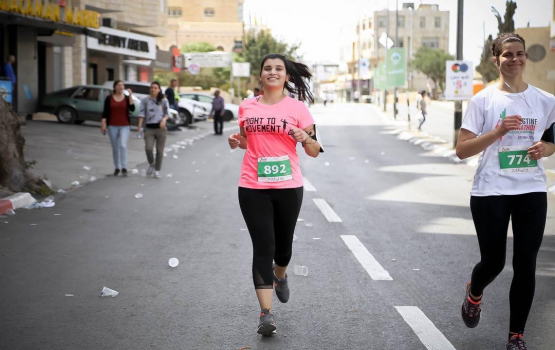 RTM is the founder of the Palestine Marathon that happens yearly in Bethlehem and is the founder of Plogging Palestine; an eco-friendly initiative that combines running with picking up litter. What makes Right to Movement innovative? RTM uses running as a tool to tell a different story about Palestine. In 2016, RTM led #MaryCantMove campaign, which was a relay race from Nazareth to Bethlehem to highlight the restrictions on movement Mary and Joseph would face by the Israelis today if they did this journey. In the same year, RTM marathoners led a race in California and ran through the streets of Silicon Valley between Google and apple to convince them to add hundreds of missing Palestinian villages to their maps. How does Right to Movement measure impact? We measure impact through the number of participants and supporters that run with our groups and also through a number of organizations involved in supporting us. RTM focus on building connections with people who are interested in hearing our story, a story that is different from what you hear in media, a story that shows our strengths and hopes for a better future for Palestine. RTM has been participating with at least ten runners (equal males and females percentage) in international marathons starting from 2014. Support to our campaigns can help Palestinian runners to run in international races and arrange different speaking tours with organizations who are interested to hear our story.